Since reaching a landmark agreement with Iran over its controversial nuclear program, U.S. Pres. Barack Obama and the White House have weathered criticism from politicians, pundits and the general public in Israel and America alike. But despite the most common accusations, Washington does not appear to have abandoned Tel Aviv for Tehran at least when it comes to military aid. After long and complex negotiations with representatives from the five permanent members of the U.N. Security Council plus Germany – a bloc commonly referred to as the P5+1 – and the European Union, Iran signed on to the Joint Comprehensive Plan of Action in July. The JPCOA’s provisions are supposed to shrink Tehran’s stores of uranium, limit how pure the remaining material can be and effectively prevent the enrichment of weapons-grade nuclear material. The P5+1 and the E.U. hope that these measures will keep Iran from getting an atomic bomb. Even before the parties finalized the agreement, Israeli Prime Minister Benjamin Netanyahu was particularly outspoken in his opposition to the deal. “I feel a profound obligation to speak to you about an issue that could well threaten the survival of my country and the future of my people: Iran’s quest for nuclear weapons,” Netanyahu told a joint session of Congress in Washington on March 3. “In the wake of the nuclear deal, Iran is spending billions of dollars on weapons and satellites,” the Israeli leader declared to the United Nations General Assembly on Oct. 1. Others were even more vocal. Opponents of the JCPOA argued that Obama had abandoned its historic relationship with Israel to side with state sponsors of terrorism. In his push for the nuclear accord and a settlement to the protracted Israeli–Palestinian conflict, “Mr. Obama posed an even more fundamental challenge by abandoning the two core principles of Israel’s alliance with America,” Michael Oren, the former Israeli ambassador to the United States, wrote in a scathing Wall Street Journal op-ed on June 16. Oren’s contention was that Obama had not only undermined Tel Aviv politically, but threatened the bond with Israel by speaking publicly about the two countries’ disagreements. “The U.S. and Israel always could disagree but never openly,” Oren said. Both countries have tried to walk back the rhetoric and mend the strained relationship. Earlier in November, Obama and Netanyahu met in Washington to try and find a way forward, including new military aid packages. But existing aid packages already prove that Washington hasn’t given up on its key Middle Eastern ally or dismissed Tel Aviv’s security concerns. Both the Pentagon and State Department have delivered or planned to deliver billions of dollars in high-tech weapons and other support to Israel. For instance, during the 2015 fiscal year, State earmarked more than half of the nearly $6 billion in so-called “foreign military financing” (FMF) money it managed to Israel, according to an internal review of the department’s Bureau of Political-Military Affairs. Tel Aviv received more funds than Egypt – the second largest recipient of the aid – Jordan, Iraq, Pakistan and the continents of Europe, Asia, North and South America and Africa combined. Under the FMF program, Washington gives grants to allies to buy arms and other military gear. Touted as a win-win for everyone involved, the deals specifically direct the money back to American defense contractors. The arrangement is just one of Washington’s well established military aid mechanisms. Most notably, the Pentagon – and by extension the American taxpayer – have helped fund the development of missile and rocket defense systems through these programs. Israel’s Iron Dome system helps shoot down the sort of unguided rockets Palestinian militants lob at civilian areas. Tel Aviv hopes the larger Arrow interceptors will eventually protect against ballistic missiles. Though sanctioned by various countries and the U.N. Security Council, Iran continues to cook up new long-range weapons. In October, Tehran showed off its latest rocket, the Emad, amid outrage from Washington and its allies. Experts have been critical of both Iron Dome and Arrow. In July 2014, physicist and engineer Ted Postol suggested that Iron Dome had not been nearly as effective as reported during a recent spate of rocket attacks. More than two decades earlier, Postol had famously testified before Congress about the failure of Patriot surface-to-air missile to knock out Iraqi Scuds during the first Gulf War. In development for nearly 30 years, Arrow has faced similar accusations. The hasn’t stopped Washington from pumping more than $2 billion into the work – estimated to be between 50 and 80 percent of the total cost of the project. So far, the Pentagon has not announced plans to purchase either system for American troops to help recoup any of those costs. “Israel is grateful to you, the American Congress, for your support, for supporting us in so many ways, especially in generous military assistance and missile defense, including Iron Dome,” Netanyahu had told lawmakers in March 2015. The aid packages aren’t limited to missiles. Under old and new deals, Israel is slated to get its first F-35 in 2016. Tel Aviv is also reportedly looking into purchasing Boeing’s advanced F-15 Silent Eagle. While not a true stealth fighter, the F-15SE proposal offers stealthy features, such as internal weapons bays, that help hide the jets from enemy radar screens. Compared to Israel’s aging 1970s-era F-15A Baz and F-15C Akef fighters, an Israeli Silent Eagle would also likely feature much more powerful radars, new targeting gear and improved communications systems. 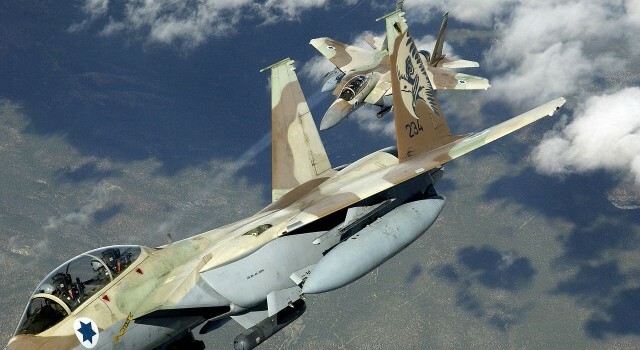 With countries such as Saudi Arabia, Egypt and Iran planning to buy the latest European and Russian types, all of these improvements would make sure Israel’s air arm is still a deadly opponent in a fight. To save money, Tel Aviv could choose to look into upgrading the older Baz and Akef planes to the new standard. On top of the planes, the Pentagon has already shipped thousands of guided bombs and missiles to Israel. And Washington has cooperated with Tel Aviv to develop other high-tech weaponry (for example Iron Beam). But American aid isn’t limited to flashy military hardware. Washington actively supports Israel’s military in the most basic way possible – by building new facilities. The Pentagon has set aside money to build everything from the Arrow missile base known as Site 512 to barracks and cafeterias. In November 2014, the U.S. Army Corps of Engineers’ Europe District held a conference for companies interested in bidding on these contracts. At the time, the Army engineers were managing projects to build or renovate command centers, power plants, docks, office buildings, guard posts and more, valued at more than $200 million in total, according to an official briefing. And every year, the Corps awards an average of 10 to 14 foreign military sales contracts on behalf of the Israeli Ministry of Defense, according to the command. The sum ranges between $3 million to $10 million annually. As of October, the Army had awarded contracts for 10 of the projects outlined in its briefing the year before. The Israelis had canned plans for dining facility in Southern Israel and a barracks for Israeli naval units. With such broad support, it’s hard to believe Washington has given up on Israel in favor of the mullahs in Tehran. American legislators aren’t likely to cut this aid any time soon either. Maybe it’s time for Washington’s other critics to take a hard look at what all this assistance might really say about American policies. The article originally appeared at Offiziere.